Break the Cycle applauds the connection between the arts and survivor stories. Many of you have shared the healing power of creation when sharing your experiences. We receive many requests to review/support/promote various forms of art. At this time Break the Cycle will only review books and other forms of survivor stories if they are directly about a young person and/or written/created by a person between the ages of 12 - 24. If you are an adult and would like to share your story please feel free to join the LINA coalition and use any of those platforms to connect with other caring adults. 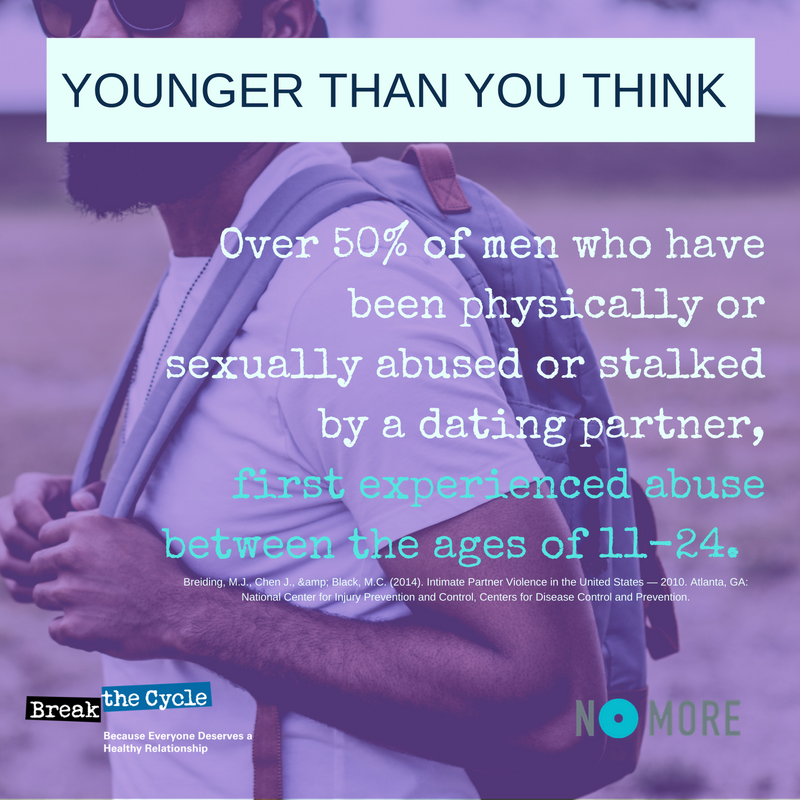 If you are 24 or younger please contact media@breakthecycle.org. 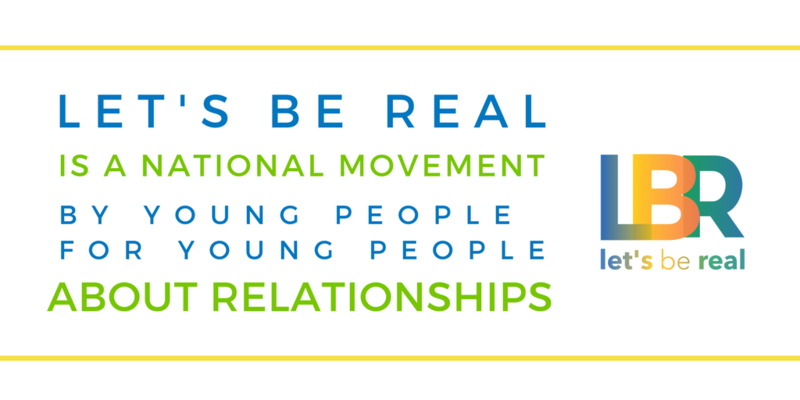 12-24 year olds can also share their stories using blogs, tweets, and artwork through Let's Be Real. 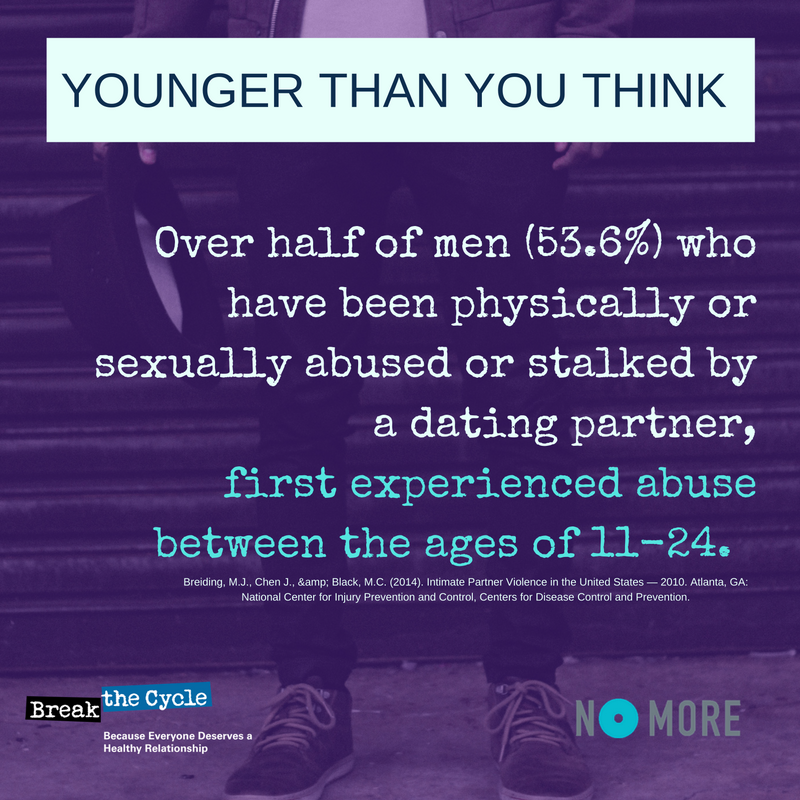 When we think of Domestic Violence Awareness Month, we often think of an older woman with children who is being abused. While unfortunately that situation is common and accurate, the story begins long before that moment. 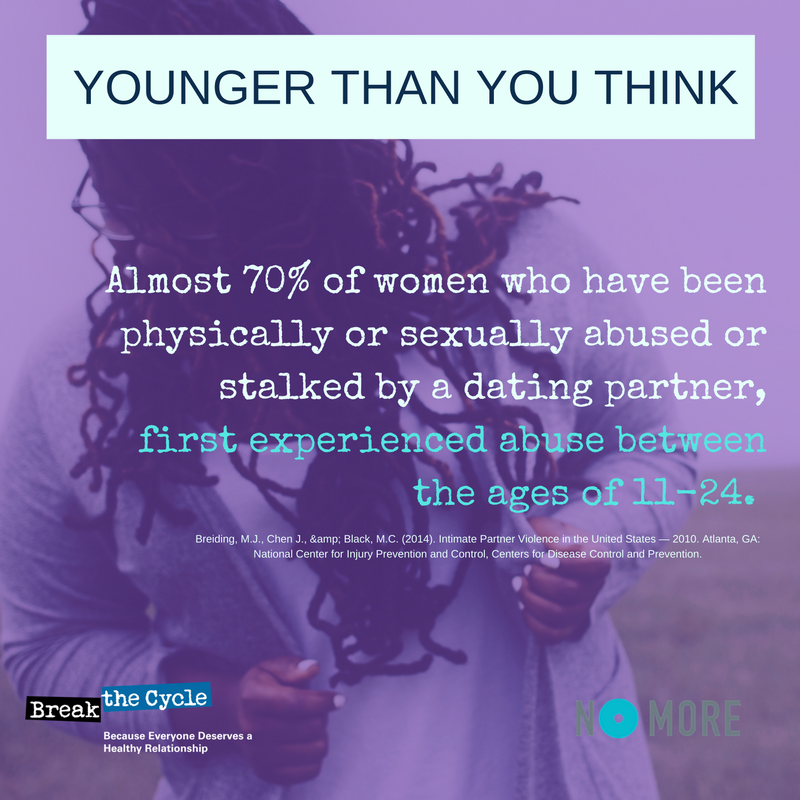 More than half of women (69.5%) and men (53.6%) who have been physically or sexually abused or stalked by a dating partner, first experienced abuse between the ages of 11-24. 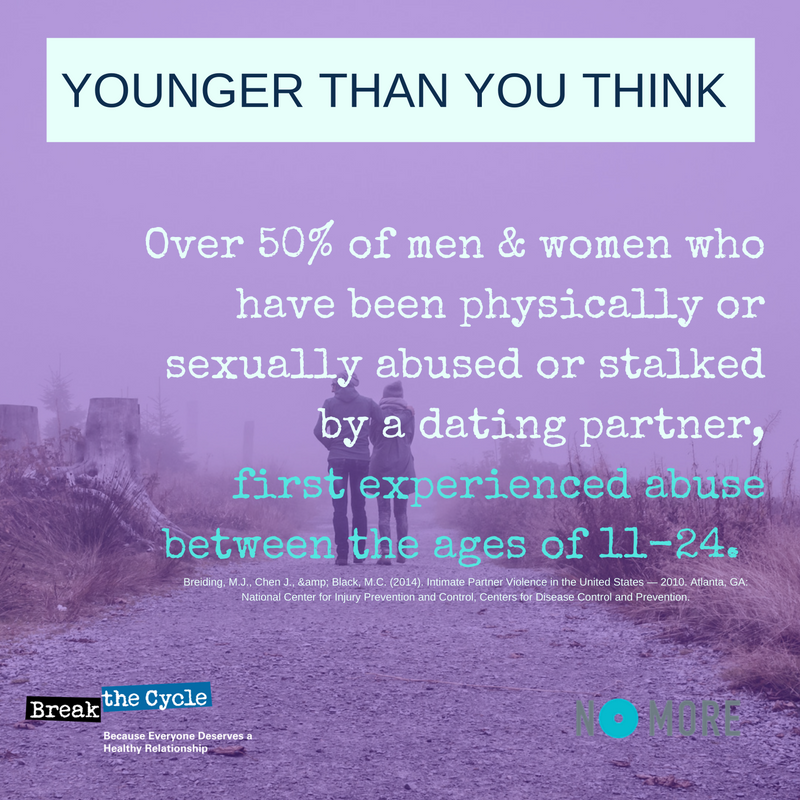 We invite you to show the reality of that statistic by sharing your stories of dating abuse and unhealthy relationship behaviors on social media with the hashtag #YoungerThanYouThink. Our hope is the hashtag will become an online home for survivors to share, connect, and heal. 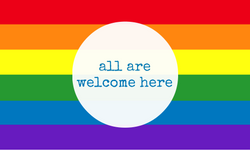 Please join us, follow along, and share the campaign photos below. 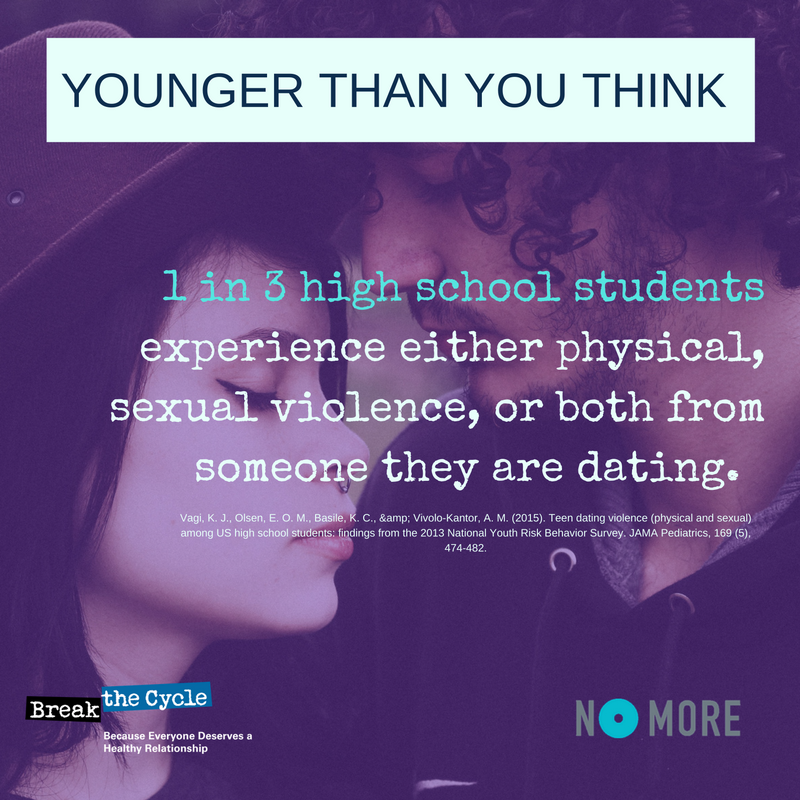 Download shareable graphics for social media like the one you see above when you participate in the #YoungerThanYouThink campaign. 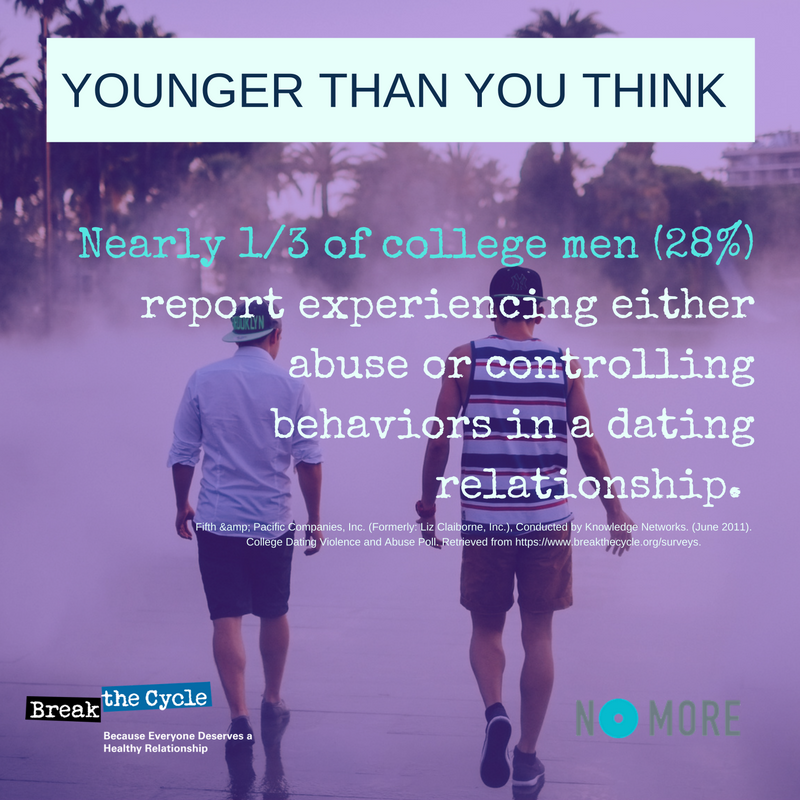 Tag us @breakthecycledv on Twitter and @breakthecycle on Facebook and Instagram! 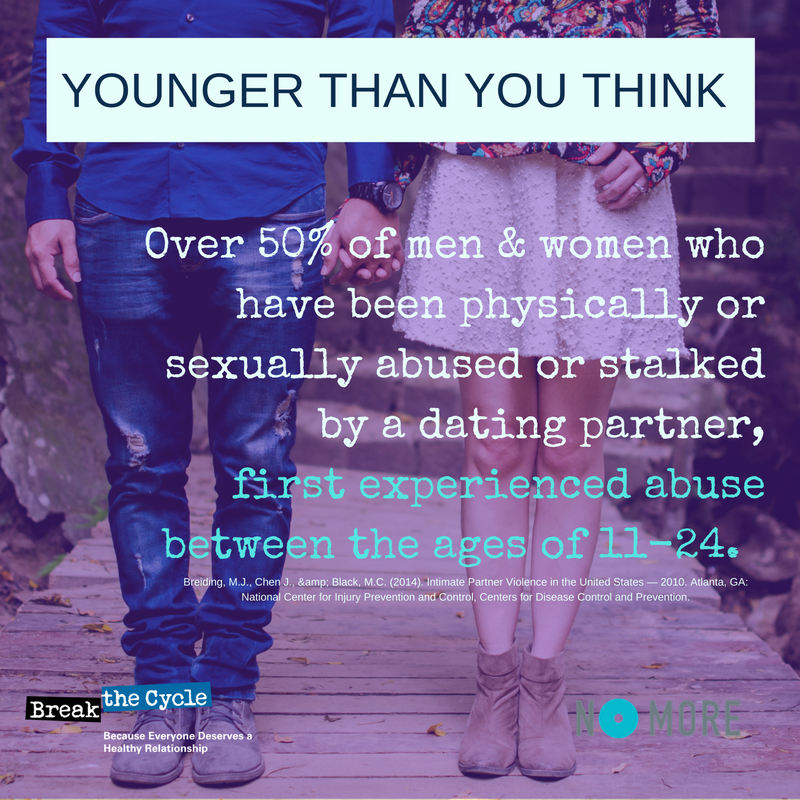 Abuse starts #YoungerThanYouThink, but we can stop domestic violence before it starts with your help. Donate to Break the Cycle here. 1Breiding, M.J., Chen J., Black, M.C. (2014). Intimate Partner Violence in the United States — 2010. Atlanta, GA: National Center for Injury Prevention and Control, Centers for Disease Control and Prevention. 2Fifth & Pacific Companies, Inc. (Formerly: Liz Claiborne, Inc.), Conducted by Knowledge Networks. (June 2011). 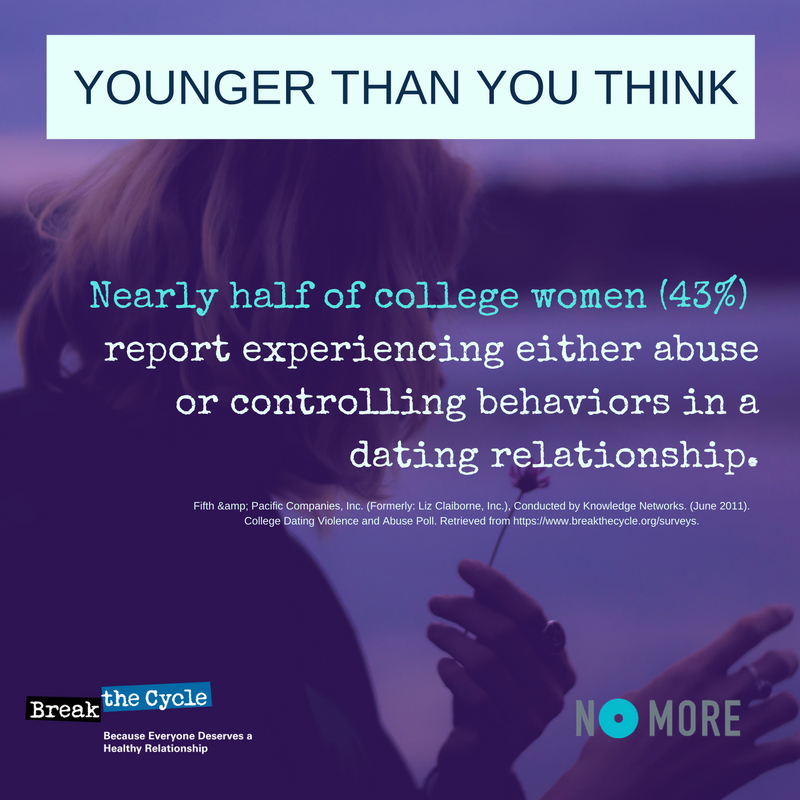 College Dating Violence and Abuse Poll. Retrieved from https://www.breakthecycle.org/surveys. 3Kann, L., Kinchen, S., Shanklin, S.L., Flint, K.H., Hawkins, J., Harris, W.A., Lowry, R., O,;Malley, E., McManus, T., Chyen, D., Whittle, L., Taylor, E., Demissie, Z., Brener, N., Thornton, J., Moore, J., ; Zaza, S. (2014). Youth Risk Behavior Surveillance Report - United States, 2013. US Department of Health and Human Services, Centers for Disease Control and Prevention. 4Vagi, K. J., Olsen, E. O. M., Basile, K. C.,; Vivolo-Kantor, A. M. (2015). 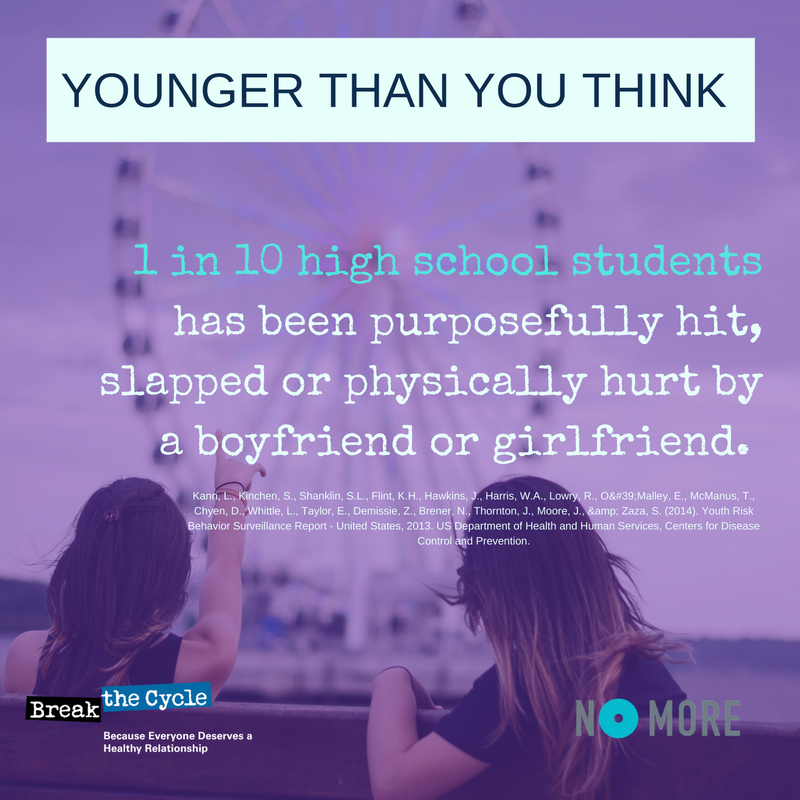 Teen dating violence (physical and sexual) among US high school students: findings from the 2013 National Youth Risk Behavior Survey. JAMA Pediatrics, 169 (5), 474-482.